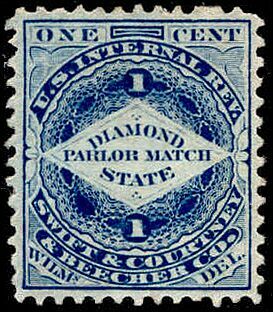 The predecessors of the Diamond Match Company were the Beecher companies. 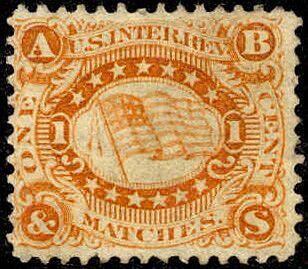 The first to have a private stamp printed was A. Beecher & Sons of Westville, Connecticut. Issue dates were from March of 1865 to September of 1874. 20,985,340 were printed on old paper and 4,656,150 on silk paper. The copy shown is on old paper. The Swift & Courtney factory was located in Wilmington, Delaware. It was one of the large manufacturers even before it merged with the Beecher company in 1870. 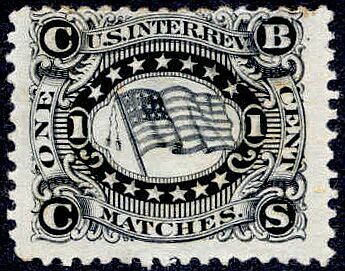 The Swift & Courtney stamps were issued from August, 1864 to August of 1875. 86,528,370 were issued on old paper and 164,421,340 were issued on silk paper. This example is on silk paper. When the National Bank Note Company took over the stamp printing contract in August of 1875 the Swift & Courtney stamp was altered to reflect the existing corporate name of Swift & Courtney & Beecher. 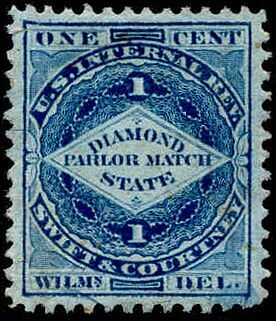 The new stamps were issued from December of 1865 to the end of March, 1883. 475,154,123 were issued on silk, pink and watermarked papers. The copy above is on silk paper. 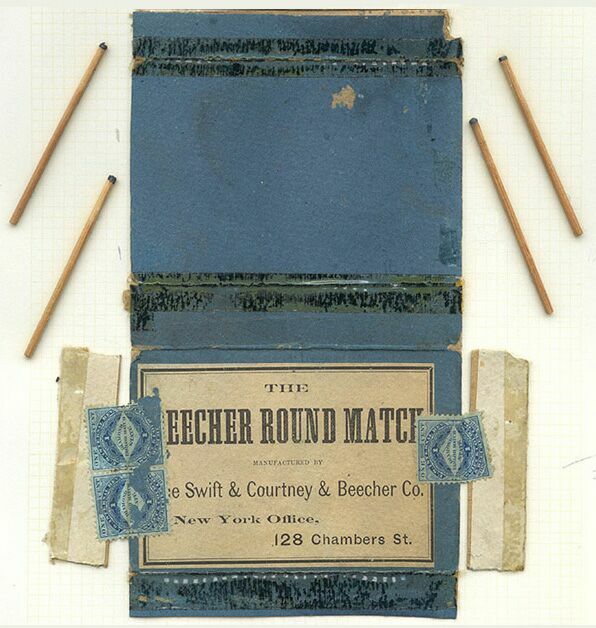 A matchbox used by Swift & Courtney & Beecher, and some of the matches from it. For some reason Swift & Courtney & Beecher chose to re-issue the original design of the A. Beecher & Sons stamp in black. The initials were altered from A. B. & S. to C. B. C. S. - apparently standing for Swift, Courtney, Beecher & Company if read backwards, starting at the lower right. These stamps were issued from March of 1879 to December of 1880. 441,000 were issued on watermarked paper.